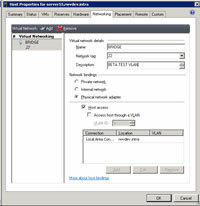 Configuring virtual networks in Hyper-V can be achieved using virtual local area network (VLAN) trunks. require a great deal of planning and testing. If you choose to implement Microsoft's Hyper-V technology, you can use either Hyper-V Manager or Microsoft System Center Virtual Machine Manager (MSCVMM) to manage the Hyper-V host and guest networking. This article explains how to configure a virtual network for a Hyper-V environment using virtual local area network (VLAN) trunks. I focus partly on the R2 beta release of Windows Server 2008 because some of its native features will appear in the final R2 release of the technology that will ship by late 2009 or 2010. 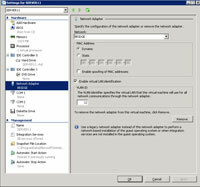 Hyper-V Manager's primary tool is Virtual Network Manager. 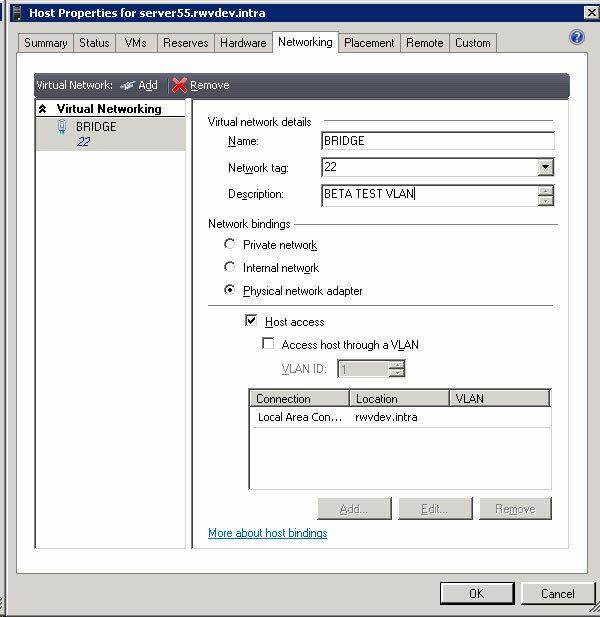 In the example in Figure 1, I have named the new virtual network BRIDGE. BRIDGE has been provisioned so it can interact with the guest VMs on the external network that's hosted on the Broadcom interface. The virtual network you create can be configured as an internal network or a private Network Address Translation (NAT) network. The networking configuration is represented as well on the guest VMs. During their provisioning process, guests can select from your created virtual networks. The configuration of virtual networks identifies the mapping of physical interfaces to the name of a virtual network but doesn't necessarily identify the address space. In all virtual environments, 802.1Q tagged ports, or trunks, are needed to provide access to different networks. A VLAN trunk on the physical switch, such as a Cisco switch, makes multiple networks available through protocols like the VLAN Trunking Protocol (VTP). Doing so identifies various networks simply as numbers. With either management tool, Hyper-V allows the management OS traffic to be stacked on the same interface as the guest VM traffic, while a separate VLAN is assigned to the host OS. This is a relatively simple configuration that illustrates that, when possible, guest traffic should be provisioned on separate interfaces rather than on the host operating system. Unique networks, such as a demilitarized zone (or DMZ), however, may require a different approach. One strategy is to build a dedicated host for VMs on these networks so that they are isolated from the hypervisor. These sensitive networks can also be provisioned as dedicated interfaces not to be shared with other VLAN trunks. This drives the interface count higher but is usually more cost-effective than additional host hardware. Hyper-V also permits guest VM traffic and the host OS to share the same interface, which may be suitable for small environments or those with low consolidation ratios. Windows Server 2008 has native Hyper-V driver support. Other OSes will need to install Integration Services on the guest OS. For systems managed by MSCVMM, this same functionality is achieved through Virtual Guest Services. Without this driver set, other guest VMs with default configurations cannot view the Hyper-V network. Hyper-V permits a guest to be assigned to a virtual interface that works with all supported OSes. 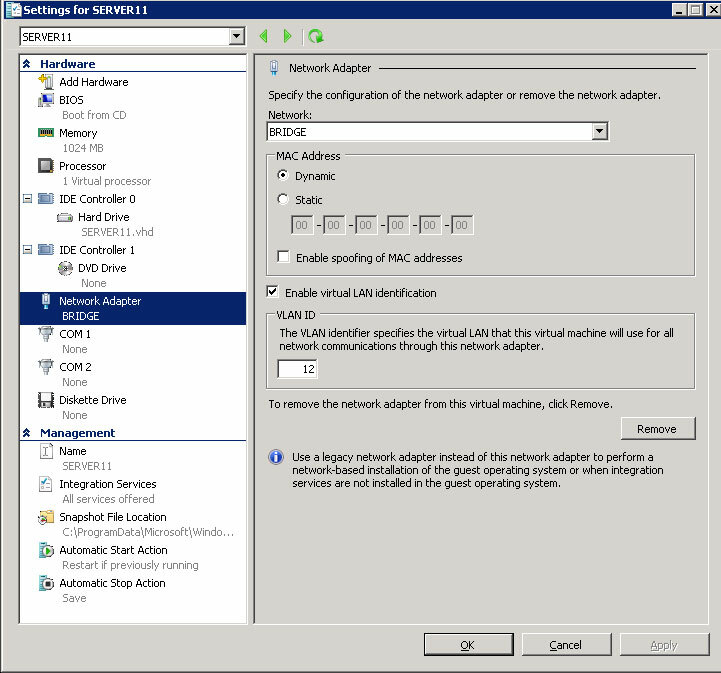 Hyper-V Manager calls this type of network interface a legacy network adapter, while MSCVMM calls it an emulated network adapter. Both management tools give the same connectivity options provided by virtual networks. Assuming the OS is updated with Virtual Guest Services, the preferred network interface in the guest VM's inventory is the standard networking adapter. MSCVMM refers to this as the synthetic network adapter. When provisioning guest networks, the guest VM is assigned a legacy or emulated virtual interface, depending on whether you use Hyper-V Manager or MSCVMM. Previously, I mentioned that a guest can be assigned to a VLAN trunk for a network as opposed to the entire virtual network being assigned a trunk in MSCVMM. This is particularly true for small implementations where a small number of Hyper-V hosts are involved. In this situation, MSCVMM would be overkill. I would not recommend entering MAC addresses on Hyper-V -- or on any other platform, for that matter -- and using the default network configuration. The default network configuration creates a MAC address that makes the system easily identifiable as a Hyper-V virtual machine. In some physical-to-virtual (P2V) or virtual-to-virtual (V2V) conversion situations, the MAC address may need to be changed, so exercise caution with this practice. I also mentioned that Windows Server 2008 can function in the native network mode and not use legacy or emulated interfaces. Other OSes such as Windows Server 2003, XP and Vista need a certain patch level before permitting the installation of Integration Services or Virtual Guest Services. Generally the latest major service pack is required for the installation to succeed and allow the guest to access the network without using legacy or emulated adapters. With Hyper-V, planning a virtual network becomes tricky when you consider MSCVMM and Hyper-V Manager's corresponding differences and overall functionality within Hyper-V. Luckily, Microsoft has several resources to get you started, such as the Solution Accelerator site on Microsoft TechNet. Overall, Hyper-V's networking features stack up well against other platforms and can accommodate the majority of environments. Rick Vanover (MCITP, MCTS, MCSA) is a systems administrator for Safelite AutoGlass in Columbus, Ohio. Vanover has more than 12 years of IT experience and focuses on virtualization, Windows-based server administration and system hardware. And check out our Server Virtualization blog.